Chris Lomas was born in Essex and brought up in Liverpool and Winchester . He started photographing people after he was given a Russian camera and a light meter at the age of 8. When his family moved to Winchester in 1985, he started taking portraits of people working & in 1988, he started a project documenting people working in Southampton 's ship yard for the local museum. 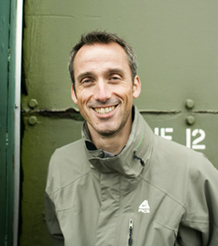 Chris moved to Edinburgh in 1988 to study a BA in photography. During the course, Chris assisted for London photographers and worked for The Scotsman newspaper. In 1991, Chris started his own business, working initially for newspapers and PR agencies. Further investment in equipment allowed Chris to start doing more creative work for UK design agencies. At the same time, he developed his lighting skills and began to explore the full potential of photography in the controlled environment of a studio. While at a prize ceremony at the Savoy Hotel in 1990, Chris was introduced to publisher Robert Prior of Design International Magazine and this led to him placing the first of three A3 International advertisements. These ads generated interest from around the world and caught the eye of an art director at Getty Images. This led directly to a 6 year working relationship with creatives flying up to Edinburgh with props each year for a week long shoot. The resulting imagery has sold in 60 countries around the world. In 1999, Chris won a Communication Arts Award of Excellence for packaging photography. In 2003, Chris's business was dramatically brought to a temporary halt by a major fire in the building where his studio was located. In spite of this, within two weeks, Chris was undertaking a large shoot for Standard Life, a client he has been working with since 1991. The fire led to large changes in the way Chris worked. The transition to digital photography was also maturing at this stage. So, in 2004, Chris moved over to digital capture and continues to offer photography with high production values. During the last two years, Chris has moved into larger set photography, working increasingly with the same team of skilled set builders, stylists and assistants. After 25 years experience of photographing diverse subjects, Chris remains committed to the same goal: to produce stunning photography, often using his trademark lighting, and delivering these to satisfied clients Worldwide. © Chris Lomas Photography. All rights reserved Studio: Coburg Wharf Building 3 Coburg Street Edinburgh UK EH6 6ET.